When you decide to take a journey, such as a long hike to see the beauty of the desert or to climb a rough mountain, you often have one, or several, motivations and expectations. It may be that you love the outdoors, you’re seeking a challenge, or you’re hiking to stay in shape. Perhaps you have expectations to see the beauty of the land, to catch a glimpse of wildlife or to progress further in your fitness plan. Do you remember interviewing and putting your best self forward to land your job? When you received that offer letter for that job you just know you are going to love, you also started that journey with a variety of expectations. These could include looking for a challenge, for security, for a great team or a fantastic manager. Marcus Buckingham and Curt Coffman in their book, “First Break all the Rules,” liken the employment process to climbing a mountain in several stages. Just as you begin your hike with expectations, as you face different terrain, views and wildlife at each stage, your expectations during the employment process will also be modified along the way. There are multiple stages in the employment journey that Coffman and Buckingham identify. In the beginning you’re wondering what is expected of you. Interviews don’t really give all the information needed. After New Employee Celebration you’ll need to learn where to get office supplies, complete further training and use UltiPro. You may be surprised that no one told you about some of the assignments you’d be given. As you sit in your chair during your first week, you may be wondering if you have what you need to get things done. Once you find out what’s expected and what tools you have, you begin to think about what you can offer and how you can show you’re a successful and valuable employee. You look for feedback on how you’re doing. You scout for people who are important to you, people who show they care for you as a person, and are interested in your skills. Eventually you get used to the job and look around for what ways to gain greater skills and value. You’ll look for clues that you’re becoming an indispensable member of the team, and evidence that your opinions count. You’ll also want to know if your job means anything and if it adds to the mission of the organization. Finally, you continue to seek growth and learning opportunities so you can expand your responsibilities and skill sets. Expectations, tools, what you can offer, how you can be successful, feedback, relationships, being an important team member and being a contributor to the mission of your organization all make a difference in the value you’ll add to the organization and to your personal development. At Recovery Innovations we’re investing in our employees. We sent out a questionnaire asking for their opinions and started with their views we used that information as a leadership team when we began developing overall organizational mission and goals. Your opinions count. Your survey responses show that empowerment, wellness, hope, community and responsibility were the top core values they shared with us. The mission and goals we developed slightly resemble “Swiss cheese.” They provide general direction for the organization, but there are holes that we need our people to help fill in. We will be holding meetings with our employees about our mission and goals for their input and to talk about how they can contribute. We will take that information and further fine-tune the path our organization will take together as we continue to support individuals with behavioral health challenges. We are working on putting resources into ensuring that our new and current employees know what is expected of them and what they can offer to the people they serve and to our organization. We are working to ensure they get the training and development they need to know how to be empowered to skillfully serve others. We are looking to expand our services in some areas to include co-occurring substance use disorder, co-morbid serious medical conditions and to support individuals at risk of suicide. I’m excited, and I believe our employees will share that excitement as we use the concepts of empowerment, wellness, hope, community and responsibility to build upon their skills to make us a stronger organization as we spread recovery and support to others. Our people will know how they are contributing to individuals and the organization as we develop a performance review system that includes the outcomes that are important to our organization. We’ll distribute the new performance appraisal template to our employees so they can become familiar with the new structure. We also want our employees to have a say in their own professional and career development efforts. To ensure that their opinions are included, employees will have an opportunity to contribute to a self-evaluation that will then be taken into consideration by their team leader. Their team leader will then contribute and finalize the review and meet with the employee to review together. We want every one of our employees to gain a greater understanding of the link between their individual efforts and the results that are achieved for their programs and our organization as a whole. Being a part of an organization that believes in its employees, trains and coaches them, gives them feedback on how they are contributing makes for an empowered organization. That kind of organization can lighten the loads of our employees and the people we all serve as they hike the journey of life together. 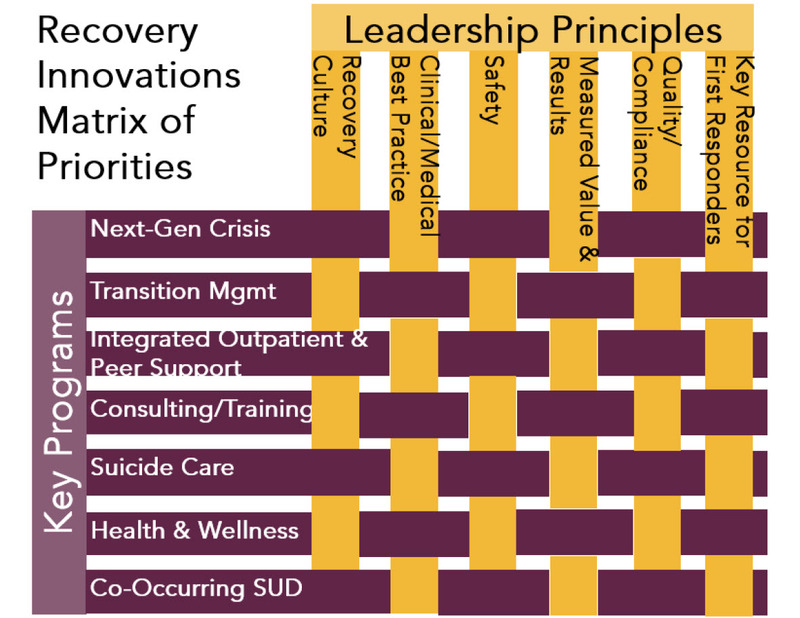 Recovery Innovations is strengthening its core mission with a clear vision and road-map. “Disturbative” and “Deep Change.” These were the two key words that fifteen members of the Recovery Innovations leadership team considered as we convened for a two-day Strategic Planning Retreat last month to focus on the future vision of the organization. 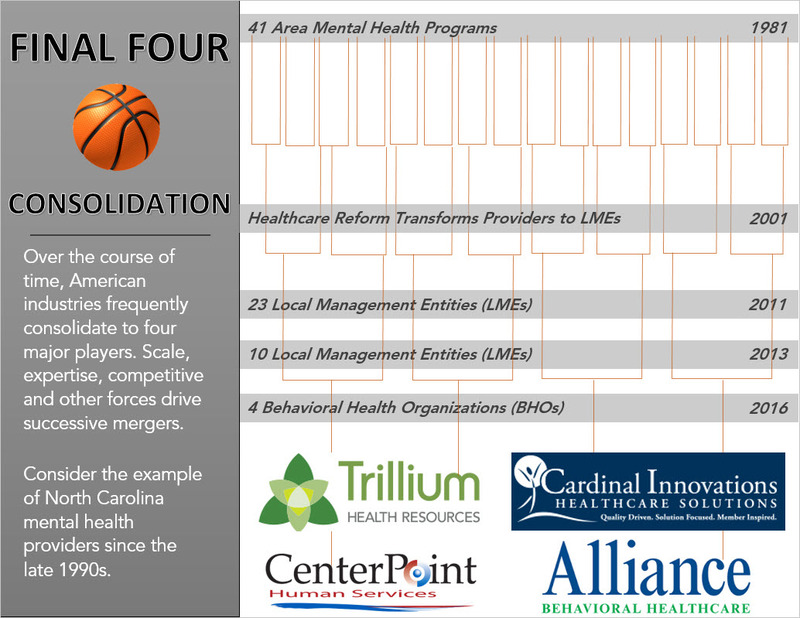 Consolidation of behavioral healthcare provider agencies. The geeks on our team could not help but think about a Game of Thrones metaphor. For five years, we have known “Winter is coming.” But it seemed far away and the wall that separates us from the forces to the north has kept us safe from change. Until today. In Arizona, the towering and indestructible, 30-year old wall protecting the specialty behavioral healthcare system from real world forces is…gone. The Division of Behavioral Health Services will dissolve in 2015, and the Arizona Healthcare Cost Containment System (AHCCCS), which is the Medicaid authority, will assume responsibility. After nearly 20 years of carve-out Managed Behavioral Health Organizations like Value Options and Magellan Health, the new RBHA, Mercy Maricopa Integrated Care, is affiliated with a full-service Arizona health plan, Mercy Care (an Aetna company). The nationwide trend is to dismantle the historic specialty behavioral healthcare administrative structure, and integrate fully into the primary care system. The former is a $30 billion industry, which is a sliver of the larger $2.4 trillion healthcare system. RI designed a strategy with both sets of customers in mind. We refer to the second major trend as the “Final Four.” The consolidation of American Airlines and US Air essentially means we now have four airline options. If the nearly $50 billion acquisition of Cigna by Anthem goes through, there will be the same number of major full service health plans. March Madness-type whittling of contenders has found its way into mental health, which has been shielded from market forces and competition in much of the country. This has been done by its wall of separation and the catchment areas of legacy providers who were originally county-based mental health providers prior to the 1980s. Reform legislation in North Carolina removed those barriers and the 41 major community mental health providers are being whittled down to four entities, a process that took just 15 years. The complexity of demands faced by behavioral healthcare executives is accelerating year over year and new competitors are entering the space. For example, A.W. Holdings was unknown in behavioral healthcare prior to 2010, but their Benchmark brand now operates significant crisis services and has competed in RFPs against traditional community mental health providers from Colorado to Georgia. So, in developing our strategy, the RI team had to consider the change in the behavioral healthcare climate, the melting of the great wall, and the integration and consolidation that follow. Today’s pace of change can take your breath away. It took 150 years for the first iteration of behavioral health institutions and asylums to be supplanted by the Community Mental Health Construction Act. After only 50 years, the CMHC era is showing its age, and many are beginning to think about a third generation. Authors like Rosalyn Carter (Within our Reach) and Frank and Glied (Better But Not Well) point to the future: one that is integrated, features peers and recovery, self-management, high technology, and better outcomes. People with Serious Mental Illness today are unemployed at the rate of nearly 80%, frequently have poor or non-existent social supports, risk suicide at rates 12 to 15 times greater than the general population, and one in three have at least two chronic medical conditions in addition to mental health and/or substance abuse issues. In addition, RI senior staff also prepped by reading Reframing Organizations, Artistry, Choice and Leadership (Bolman and Deal, 2008), which describes a four-frame model for management, with simultaneous focus on the structural, human resources, political/strategic, and symbolic frames. And, we evaluated strategic planning documents from SAMHSA and other leading healthcare organizations. To kick off a process of communication and engagement with staff and stakeholders, survey data was gathered prior to the session in the areas of values, goals, programs, services and priorities, as well as strengths and weaknesses. More than 500 staff participated. A separate survey of staff training, skills, and supports for suicide care was also conducted. Our agenda started with an environmental scan of the industry, both current and forward-looking. Within that context, the group identified the unique current and future contributions Recovery Innovations can make to the health care field. The second day focused on how the organization can achieve stability, sustainability, innovation, and profitability moving forward. The Customers: Who are the RI stakeholders and what do they need? The Good to Great Sweet Spot: Where is the intersection between what RI is passionate about and what it does really well? The Matrix: What are the central RI services and programs, as well as the cross-cutting leadership principles they embody? Later in the month, the Board of Directors held a one-day follow-up. Additional cascading events will occur, engaging the full Company workforce, over the course of the summer and fall. This is where the vision will become a tangible action plan. Empower people to recover, succeed in accomplishing goals, find meaning and purpose in life, and reconnect with themselves and others. Activate the next generation of frame-breaking healthcare innovation to support people going beyond their behavioral health needs to succeed in the community where they live, work, and play. Healthcare Innovation: We’re putting the “innovate” back in Recovery Innovations with enhanced services in four primary areas. These key business lines will target the central needs of our primary Customers, which are the state and county mental health authorities and health plans that fund RI services and programs, with the intent to migrate all programs to the “bull’s eye” (where RI is viewed as indispensable to the fulfillment of the funder’s mission and responsibilities). Employee Investment: RI will value our employees by attracting the best talent and cultivating in our work environments a highly confident, competent, and caring work force. Through our survey and dialogues, we’ve gained valuable insight to the needs of our employees. To help them thrive in their career, we’re co-creating a plan to implement skill-building and professional development, greater two-way communications, consistent performance reviews, and leadership training. Solution Optimization: RI has some significant gaps in the electronic systems required to support a $60+ million per year company. We are going to leapfrog to best-in-class systems across the board, and anticipate and exceed the pace of future change. We’ve hit a point of growth that requires improved electronic systems so we can work and serve others more effectively. RI will first conduct an assessment of gaps and risks. Solutions will be identified, prioritized, and implemented. Strategic Expansion: RI will develop the business/program scale and capabilities to exceed the pace of current and future change related to healthcare and system reforms. Recovery Innovations has experienced rapid growth since its inception, and we’re going to ride a wave of growth again. Rather than taking on the cost and time to re-invent the wheel, we’re looking to broaden our horizons by partnering with others who can help us offer even more effective and innovative healthcare services. This requires that we create a strong and attractive international brand and identify and pursue not-for-profit organizations that would strengthen Recovery Innovations (including the Balance Sheet), complement our recovery culture and services, and add an advantage to the fulfillment of the strategic plan. Crisis Services: our fastest growing area with new programs in Arizona, California, Delaware, Texas and Washington State will add new partnerships to enhance technologies and service lines to our existing array of Recovery Response Centers (Crisis Stabilization Programs), Evaluation & Treatment (Involuntary & Court-ordered Treatment), and Crisis Respite. Transition Management: another area of strength, the Company will expand our Peer, Crisis, and Health Navigators to ensure successful community transition of our participants (diverting from inpatient hospitalization and re-admission) and demonstrate measurably both the recovery and cost-savings benefits to our funders. Integrated Outpatient & Peer Supports: our national footprint of Wellness City programs is impressive, and the Company will add clinical, medical, and routine primary care, creating fully-integrated health homes. This will provide even more well-rounded services and will strengthen our capabilities to support individuals at risk of suicide, co-occurring substance use disorder, and/or co-morbid serious medical conditions like diabetes, COPD and heart disease. Consulting and Training: today’s international success is based largely on how the Company has shared our innovations through the Recovery Opportunity Center over the past decade, and we will expand and extend these consulting and training services. 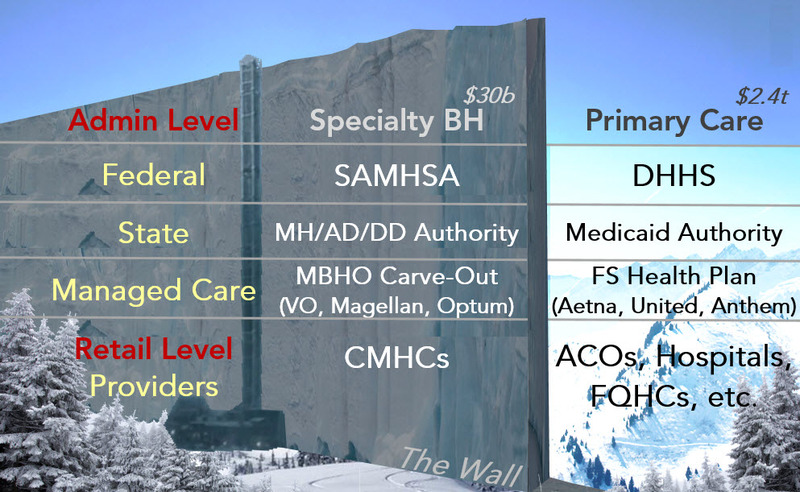 There are definitely challenging times ahead for non-profit behavioral healthcare providers that were established in the shadow and protection of the great wall. Yet, it’s a great time to work at Recovery Innovations. I am excited and looking forward to the journey. Our Company is dedicated to deep change and making a difference in the lives of all those we serve. With our employees around the world and our Board of Directors, we will partner with our Customers, both old and new, and create this vision of recovery and community inclusion together.